The Olympics are coming to London and the games are apparently a perfect opportunity for Mini to launch a new special edition. To be fair, Mini would view a sunny Tuesday as the perfect opportunity for a new special edition. Still, the Mini London 2012 Edition is here, and it's arrival has been marked in a rather unique way. 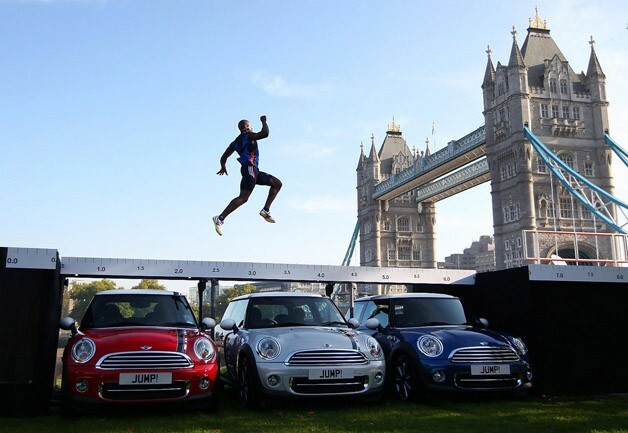 Mini parked three examples of the all-new limited-edition Cooper side-by-side then enlisted the help of England Long Jump Champion J.J. Jegede to do what he does best. Offered up in either Chili Red, White Silver or Lightning Blue, the Mini London 2012 Edition Coopers can be had in base, D, S or SD varieties. Each is outfitted with a pair of unique 17-inch gray wheels, red, white and blue interior stitching and a host of upgraded interior features such as lounge leather sport seats and chrome accents. The most notable interior feature, however, is the etching of the London skyline, which has a beautiful piano black backdrop.